Annual fundraising auction exceeds goal for student scholarships. El Dorado, Kan.-- Nearly 350 guests attended Butler Community College Foundation’s 21st Benefit Auction. And because the auction was 21, the extravaganza was modeled after the 21 Club in New York City. The event raised more than $240,000. The evening featured a silent and live auction, a dice rolling game, a golden ticket drawing and a surf and turf meal. The item netting the greatest revenue was an “Around the World Dinner” hosted by four couples in their homes at Flint Hills National Residences followed by an overnight stay in a lodge. Selling twice, this item netted a total of $11,000. The high bid of the night was $7,000 for a stay in a Mountain Village Ski Condominium in Telluride, Colo.
Butler’s President Kim Krull, Ph.D., reminded the audience of how much their gifts mean to the students who attend Butler – and how without their generosity, some students would not be able to afford college. Sarah-Jane French, a freshman from Virginia, said she would not have come to Butler if it was not for her scholarship. French is on the nationally-ranked Livestock Judging team. Along with the one dozen livestock judging students, fine arts students both performed and added ambiance to the event. All the seats were full, and the guests were talking to friends and bidding, knowing how important the money raised will be to students. “Butler benefits the community and gives educational opportunities to some young people who wouldn’t have had that opportunity,” said Wink Hartman, a Butler supporter. Wayne Chambers agreed with Hartman. Miss Kansas 2017, Krystian Fish, a guest speaker and alumnae, praised Butler for her success. Dylan Walker, a nursing student, told the crowd they are helping him learn to help others through their support. Milana Joslin, a sophomore headed to Wichita State University, expressed her gratitude and told the attendees that the scholarships she was given were the motivational factor for her attending college. Many Butler and Sedgwick County businesses donated auction items and supported the event as sponsors. The top sponsors were: Holly Frontier, Bank of America, BG Products, Commerce Bank, and Professional Engineering Consultants. 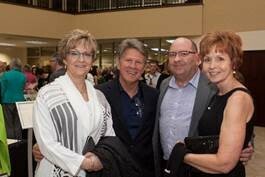 Rod and Terry Young served as honorary chairs of the successful event. Rod Young is president of Professional Engineering Consultants (PEC). Philanthropic contributions to Butler Community College are coordinated by the Butler Community College Foundation. The foundation manages fundraising efforts with alumni, friends, corporations and foundations to secure private support for the college. For more information about the Butler Community College Foundation visit our website at http://foundation.butlercc.edu or find us on Facebook www.facebook.com/butlerfoundation.